Lock in a great price for Le Panoramic – rated 9.2 by recent guests! Completed renovated with gorgeous views, central location, terrace and pool! The hotel is very peaceful. The staff is very polite and calm and peaceful. 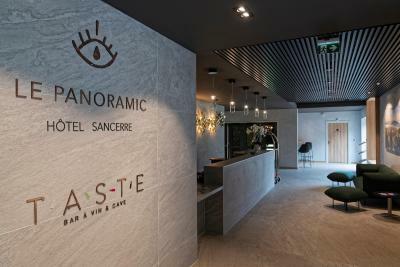 Fantastic overnight stay at this beautiful Hotel in Sancerre, will definitely return later this year. Our room was lovely, next time we will book a room with a view overlooking the vineyards, the view is fantastic. Staff very helpful and friendly, breakfast is a must. The location is amazing . It looks over a valley full of vineyards. Breakfast was very good. Staff are friendly . The selection of wine by the glass in the lounge was also really good. Thoughtful staff catered for my gluten free breakfast requirement and I was most grateful. We have stayed there before and LOVE the renovation. Staff is excellent - funny and helpful!! Good base location for Sancerre area with car parking opposite. Clean, modern hotel with great views from valley-facing windows. Excellent, friendly service and co-operation from English-speaking staff - first class! Set in Sancerre, the hotel Le Panoramic welcomes you right in the midst of a vineyard and boasts an unrivaled view of the vines. Totally renovated, all guest rooms are air conditioned and equipped with satellite TV and Wi-Fi Internet access. Each room offers a unique view of the hillsides of Sancerre, a region famous for its wonderful wines. Le Panoramic’s suites also offer a comfort of high quality. Their lounge area allows you to relax or invite your friends in an intimate and friendly setting. Take time to enjoy a sumptuous breakfast while admiring the sunrise over the hillsides of Sancerre, then explore this charming area. When would you like to stay at Le Panoramic? This air-conditioned room offers free Wi-Fi, a flat-screen TV with cable channels. The private bathroom has a shower. This room has a view of the valley. House Rules Le Panoramic takes special requests – add in the next step! Le Panoramic accepts these cards and reserves the right to temporarily hold an amount prior to arrival. Coffee not so good at breakfast. Modern and clean hotel with very helpful staff. Good place to stay for a night or two. Grey stairwell and corridors, a bit dark and oppressive decor there. No food available at lunchtime. It was a slightly rainy day and we fancied staying in. No real matter as several good places to eat in town. Also given generosity of the breakfast available, more food not really essential a couple of hours later. Our room was near the road and on the morning very noisy. Bed were a bit to narrow.